Was a time, dear reader, when working in the wide open savanna of Martlesham Heath could leave a man-cub feeling somewhat isolated. Sure, facilities at the fibre-founding Labs were fine but telecoms types cannot live by civil service steamed puddings alone. About the only watering hole within walking distance was the quotidian Douglas Bader. Anything else, you'd have to head out on safari in a motorised vehicle. Then came much choice in the form of the bus cafe and Langers Snack Bar and the Martlesham Cafe and Costa and M&S and even KFC and Greggs — pause for breath — plus the titan that is Tesco. 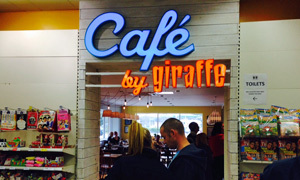 It's a jungle out there, especially now that the former in-house humdrum caff has been rebranded as Cafe by Giraffe. You know, that "feel-good" chain with high up branches in Norwich and Chelmsford and Bury? Very much the same physical space as before, clearly, though now with a far more vibrant atmosphere. They've even stuck in the odd diner-style booth. Smiling ladies ask what we'd like and we're stumped. Far too many fresh and varied options up on the board (and also available in a handy-sized fold-up leaflet). Er... Salads? Hot dogs? Savoury croissants? Mighty pleased with my bowl of chilli with salsa and avocado, including a free discussion with the waitress on how to pronounce the word "chipotle": the jury's out. Kev's even more delighted with his green chicken curry with extra chillies -- "top marks" -- though Andy's underwhelmed with his smoky bacon bap. Sassy San Pellegrino is slurped on the side. Back up to the beaming ladies at the counter to order what turns out to be a really good hot and strong flat white, albeit with a foamed milk pattern resembling a Rorschach test. Are those two spotted hyenas? That slab of shared chocolate cake is good, too. Sitting among bright paintings and eating vaguely exotic food seems somewhat at odds with the mundane shopping experience a few metres away through that doorway. As long as you don't expect to look out of the window and see herds of okapi sweeping majestically through the 24 hour garage, you'll enjoy it. If it was a car -- Jeep Wrangler. If they were passing by -- Lisa Kudrow.